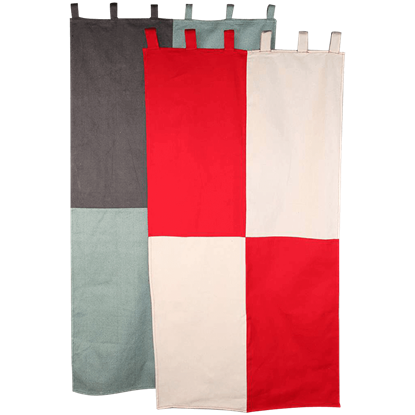 Made from sturdy cotton, the Canvas Standard is a great way to declare your presence at any LARP event or historical reenactment. Available in several colors, this banner can easily be affixed to various mounting through its loops. 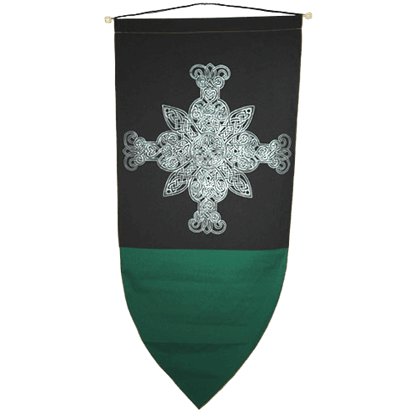 This banner depicts a four-armed cross with a Celtic knotwork design. An ancient symbol of balance, originally carved on stone. It represents the four directions, the four elements, the four seasons, and pre-dates the Christian Cross. The Celt Dragon poised to strike as his tail curls and wings expand! The Celtic Dragon is a feared creature of medieval lore. The Celts and Saxons adopted their images from the battle standards brought there by the Roman legions. The feared Celt Dragon poised to strike as his tail curls and wings expand! The Celts and Anglo-Saxons adopted their images from the battle standards brought to their land by the Roman legions and the head and wings of an eagle. Our Celtic Triscele Banner features an ancient symbol of eternity, as well as The Trinity of Life, which includes; Mind, Body, and Spirit. Life, Death, and Rebirth. 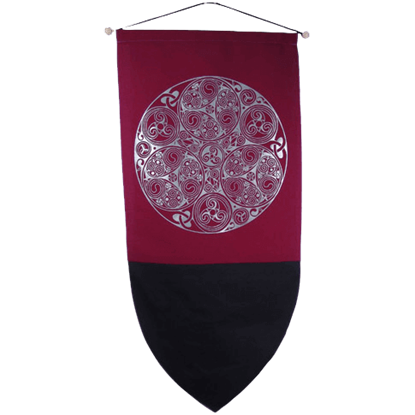 The Celtic Triscele Banner has a deep red top with a black bottom. This mythological beast from Mesopotamia and ancient Babylon guards and protects all, gifted with the body of a lion and the head and wings of an eagle. 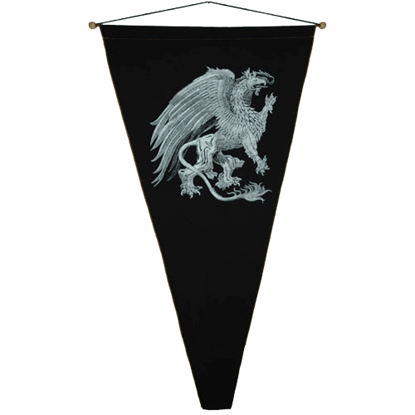 This Medieval banner depicts a gryphon with claws raised in anticipation of battle! The gryphon is a protective symbol that represents strength and vigilance. 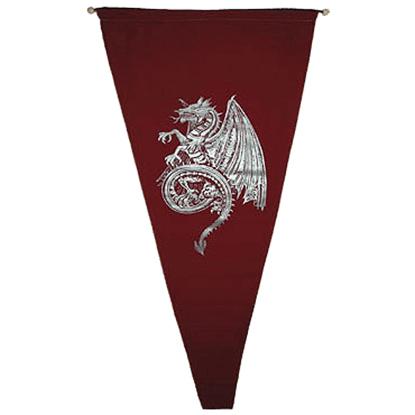 The Great Griffin pennant is made of durable cotton and includes a wooden hanging rod. The griffin is silk screened in silver on a black background. The crest of the Heraldic banner is a double headed eagle with a crown between them. 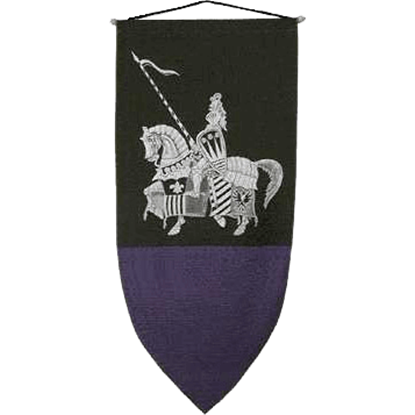 The Heraldic Banner coat of arms banners depicting great crests have hung in the halls of medieval nobility symbolizing rank and power. 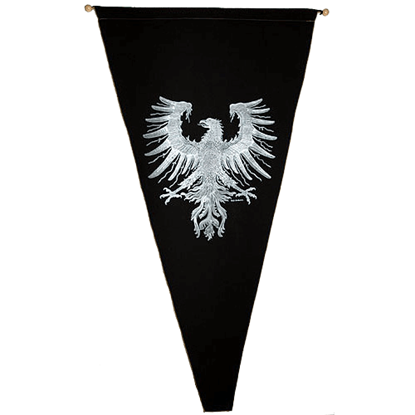 The Heraldic Eagle Pennant is a powerful eagle with its beautiful wings spread out. 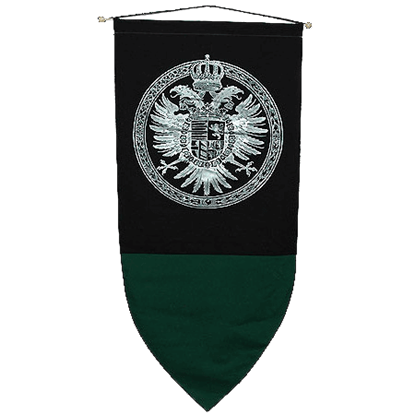 This inspiring medieval pennant will add honor and a royal touch to all decors! 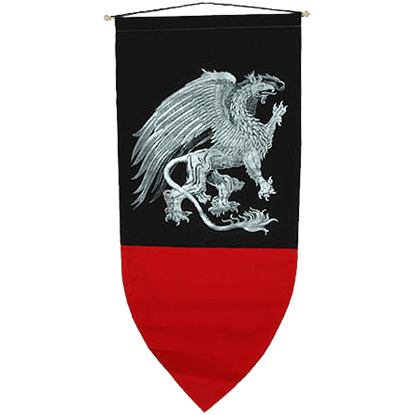 The eagle on this medieval pennant is an image inspired by falconry. 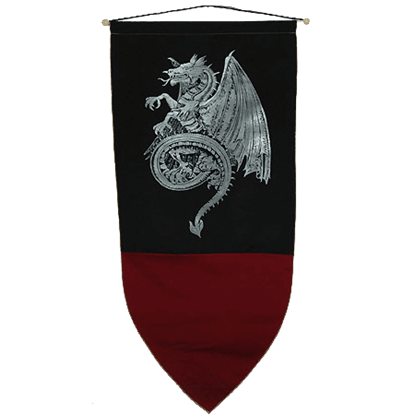 The Heralds banner is great accessory to the Herald trumpet and can also be used to hang on a wall of your home. 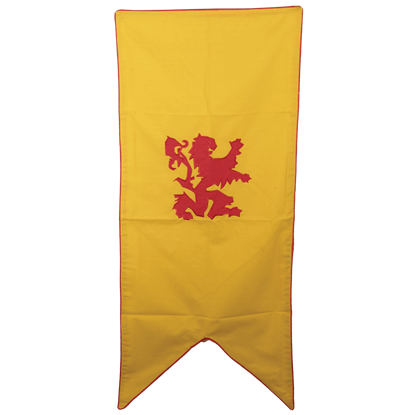 The Heralds banner features a yellow medieval style banner with an embroidery of a red Rampant lion in the middle. 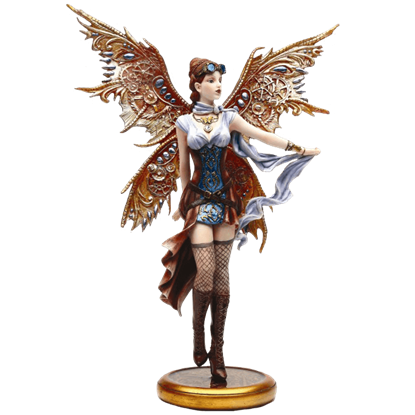 Jess, the steampunk fairy aviator, is queen of the steampunk fairies, and the Jess Steampunk Fairy Statue captures her beauty perfectly. She is dressed in a white blouse with a brown and blue corset with intricate, bronze swirls on it.